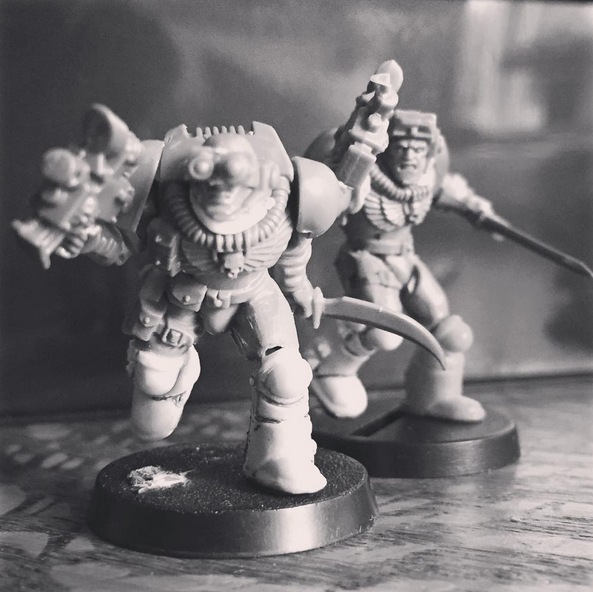 Firstly to long time readers of the Scythes of the Emperor website, thank you for your patience as I had a bit of a hiatus from Marine modelling. Had a full on Warhammer Fantasy push of late and also a lot of my focus went to sourcing and buying Warhammer Kits that are doomed by Age of Sigmar. Sadly I missed out on my beloved Bretonnians, which was distinctly upsetting. But we move on and I’ve been able to source a lot of Tyranid foes, marine parts and established the method ahead for the marines in the campaign. First back on the workbench are the Scouts. I’ve added specialists to the ambush section, heavy weapons to the tacticals and working on the particularly short lived Assault section. Across the collection I have some green stuff work to finish, sprue clean up and a few more kit parts to add. The entire Assault section will be fast moving full of action; to stand still is to get swarmed and die. I am completely unsure how long these guys will last in the campaign; call it a sick fascination haha. The Ambush and Recon section have serious close range firepower. 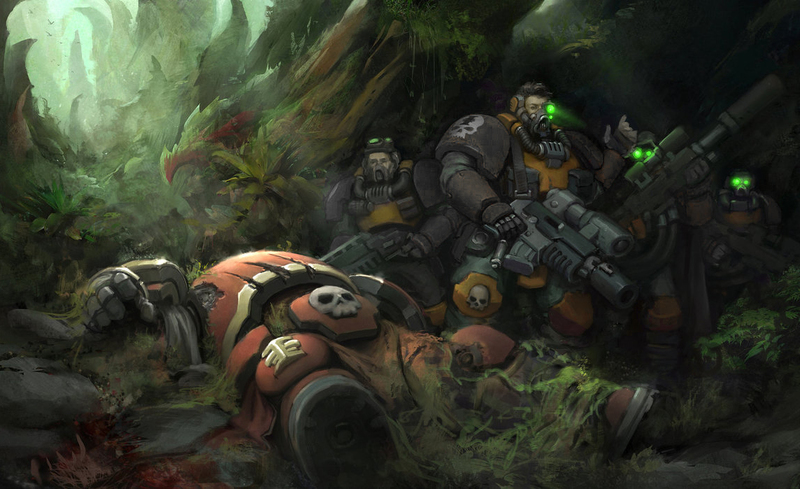 These scouts skulk ahead of the rest, tracking Tyranids and ambushing node creatures. Dangerous work, which requires sudden and rapid fire power of shotguns, grenade launchers, flamers and overwatch from a Sniper. There is a fair bit of Greenstuff work to do on the capes to complete the look. Thank the gods for the new Dark Angel kits. 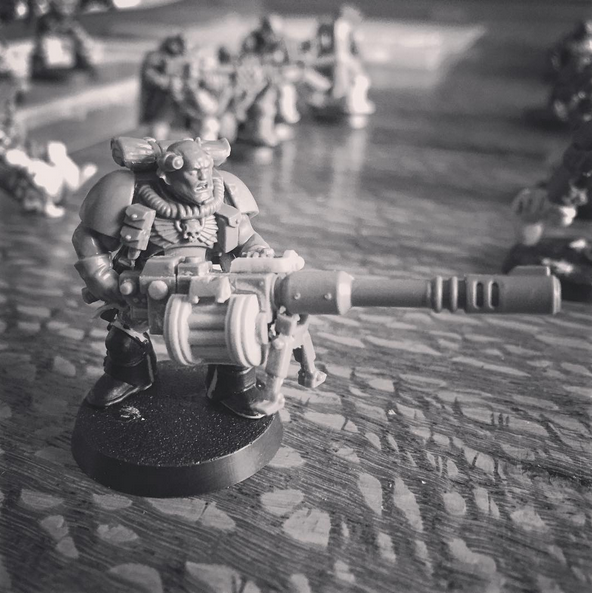 And now, after some years of wondering; using Mechanicus Strider weapons, IG Autocannon and Heavy Bolter parts, I was able to create a portable Autocannon. 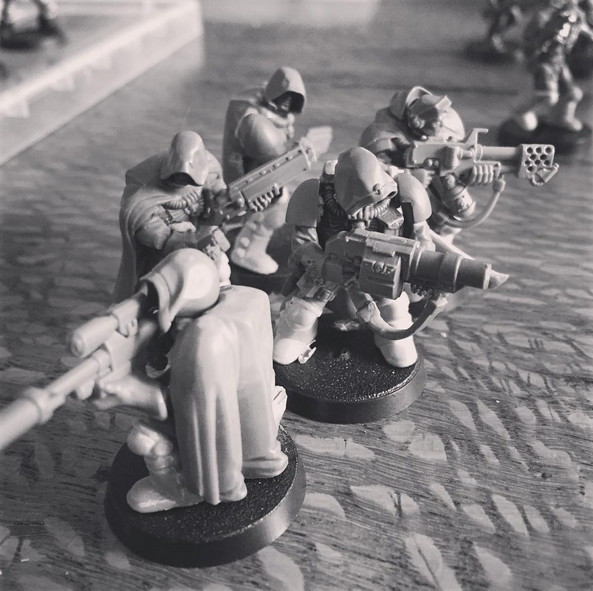 I’m 50/50 on the length (even with Suspensor hand-wavium) – Curiously the bipod is the same on a Heavy bolter in scale to the autocannon, but looks a little anemic. I may use a strap line from the Scout’s shoulder to “hold up” the weapon visually. Amusingly, still looking for “Balance” in this figure haha. For the scout with autocannon, you might want to look to the plastic Sentinel Autocannon. I’ve used it on my Genestealer Hybrid (for the 1st ed. Space Hulk blip list) and it works nicely as a man portable weapon. Now I just need to source a second one for the other hybrids on the blip list. I have in fact done so, its actually larger?! However, I did happen to have a Death Korp Autocannon, which is very slender and has the right kind of functional build to be appreciated. It’s me Bren Gun’ – Lock Stock and Two Smoking Barrels movie. Very cool. I’ve wondered recently with the re done space marine kits why gw haven’t gone all out on a scout kit. So many possibilities for commando style units. Your conversions showcase how cool scouts can be.